HI, the best source of what is around would be the bar graphs from the Birder's Guide, found here: http://wabirdguide.org/bar-graphs/. Most non-moving water in Pend Oreille freezes in the winter unless it's fed by a warm spring or is heated, though the river never freezes, so that is a source of bird activity. For the most part, what's around are birds that don't migrate or drift down from farther North: waterfowl, woodpeckers, corvids, nuthatches, chickadees, finches. Hope this helps! 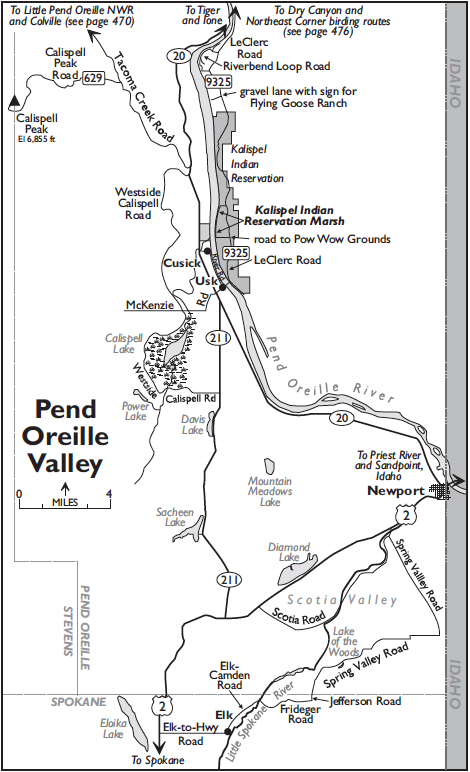 The Pend Oreille River flows west from Idaho into Washington at Newport, then bends north toward British Columbia, where it empties into the Columbia River. The southern Pend Oreille Valley sits in a depression known as the Newport Fault, which also marks the southern edge of the last glaciation. As the glaciers began to recede at the end of the ice age, ice dammed the streams, flooding the valleys to the south and leaving behind a landscape of glacial debris and lakes. Today, this area and the glaciated land along the Pend Oreille just north of it have a number of notable birding sites in riparian and wetland habitats. Coming from the junction of US-2 and US-395 at the north edge of Spokane, take US-2 north toward Newport. For some good owling and other birding possibilities, turn right in about 21 miles onto Elk-to-Highway Road and travel eastward to Elk. In 3.4 miles, just after the Elk post office, turn left onto Elk-Camden Road, which follows the Little Spokane River northeastward. Turn right in 2.3 miles onto Frideger Road, cross the river, and climb out of the valley. The road soon becomes gravel; look for Wild Turkeys where it crosses Ponderosa Pines with brushy understory. In 3.1 miles, turn left onto Jefferson Road. Drive 0.5 mile, bear left at a junction onto paved Spring Valley Road, and continue to Lake of the Woods, set in a deep, forested valley. Stop at a pullout bordered by large rocks, on the right (2.3 miles). Summer finds Willow Flycatchers, Gray Catbirds, and Common Yellowthroats conspicuous about the large marsh at the east end of the lake, below the pullout. Douglas-fir forest by the road should yield Olive-sided Flycatcher, Cassin’s Vireo, and Western Tanager. Searching for Barred and Northern Saw-whet Owls can be profitable in late winter and spring. The best spot is about one-half to one mile east of the lake, up the hill along Spring Valley Road. This is timber company land; bird from the road. Barred Owls are in dense, swampy forest to the south along with Warbling and Red-eyed Vireos, Black-capped, Mountain, and Chestnut-backed Chickadees, Swainson’s Thrush, Northern Waterthrush, MacGillivray’s Warbler, and American Redstart. Continue east, then north, on Spring Valley Road for about nine miles to the intersection with Scotia Road. (Continuing straight, then turning right onto US-2—just ahead—brings you to Newport in about three miles.) Turn left onto Scotia Road, which follows the Little Spokane River down the Scotia Valley (all private property; bird from the road). Alder and Water Birch thickets along the river may have Common Redpoll and Pine Siskin in winter. In 10 miles, turn left onto US-2, drive west 1.7 miles, then turn right onto SR-211. Follow SR-211 for 4.1 miles to Sacheen Lake. Turn left onto Sacheen Terrace Drive (the second of two roads next to each other on the left), which immediately curves to the right and passes a fire station (unmarked). Stop to view the moist grasslands across the road to the south. Three-tenths of a mile from SR-211, turn left at a Public Fishing Access sign (Discover Pass required). Park near the boat ramp. This is one of the most reliable locations in Eastern Washington to hear American Bitterns in the early hours of day. Look for Ospreys and Vaux’s Swifts. You might see a Hooded or Common Merganser or other waterbirds on the lake. Return to SR-211 and turn left. In 4.3 miles is a turnout on the right (east) side, about half a mile south of Davis Lake. Opposite, a paved road crosses private land to Camp Spaulding. Although traffic noise can be bothersome, birds that may be found on either side of the highway include Virginia Rail, Willow Flycatcher, Warbling and Red-eyed Vireos, Swainson’s Thrush, Gray Catbird, Cedar Waxwing, MacGillivray’s Warbler, Common Yellowthroat, American Redstart, and Yellow Warbler. A public boat ramp (1.4 miles) provides access to the shoreline at the other end of the lake. You may see a few Red-necked Grebes in the breeding season and a small number of ducks in migration. Calispell Lake is among the most diverse breeding bird areas in Eastern Washington. Over 200 species have been documented here with local and regional rarities including: Ross’s Goose, Franklin’s Gull, Black Swift, Lewis’s Woodpecker, Least Flycatcher (nearly annual), Eastern Phoebe, and American Tree Sparrow. Continuing north on SR-211, in 1.1 miles go left onto Westside Calispell Road. Here begins a loop around Calispell Lake. Birding in the moist woodlands, forested hillsides, wet meadows, marshes, and open waters along this road can be excellent. However, all bordering land is private property, and you must bird from the road. Stop to investigate marshy areas for American Bittern, Virginia Rail, Sora, and winnowing Wilson’s Snipe. All of the typical non-sage-steppe breeding passerines of Eastern Washington have been documented at Calispell Lake, some in abundance. This is among the best places in Washington to find specialty birds of the wet interior forests, including healthy breeding populations of Red-eyed Vireo, Northern Waterthrush, American Redstart, and Bobolink, the latter of which seem to have proliferated a bit in recent years. For the first part of the loop, you are distant from Calispell Lake; the road draws nearer between seven and eight miles, allowing reasonable scope views. Calispell Lake can produce breathtaking numbers of birds. In March, it is a well-known stopover for large numbers of Tundra Swans (up to 2,000) and many thousands of geese and ducks. All the atypical geese of interior Washington have been documented here, including Greater White-fronted, Snow, Ross’s, and Cackling. Wood Duck counts in late spring can be upwards of 50 birds. Nearly all the regular breeding waterfowl in Eastern Washington breed or have bred at Calispell Lake. In spring, locally rare shorebirds including Black-necked Stilt and American Avocet can be seen wading the edge of the lake. Beginning in May, large numbers of Black Terns nest and feed in the lake, typically in the dozens, but occasionally up to 100 birds are seen. Bonaparte’s Gulls are also annual in May in small numbers. On the south-facing slopes north of the lake, one will encounter dry Ponderosa Pine/Douglas-fir forest that provides some of the only local habitat for specialty birds of this ecosystem including healthy breeding populations of all three nuthatch species, Brown Creeper, House Wren, Yellow-rumped Warbler, and Red Crossbill. Check aspen groves for boisterous Red-naped Sapsuckers and singing Least Flycatchers during breeding season. Beginning in July, look for shorebirds in the shallows, especially yellowlegs. In 9.1 miles from SR-211, turn right onto McKenzie Road. Go east across a slough, the outlet of Calispell Lake, checking fields to the north for Bobolinks. Turn left at a junction in 1.1 miles, keeping on McKenzie Road until reaching the stop sign at SR-20 (1.2 miles). Fifth Street, the entrance to Usk, is directly across the highway. Take Fifth Street east from SR-20 into the tiny mill town of Usk, home of the Ponderay Newsprint plant. Continue ahead over the railroad track to the Pend Oreille River bridge (0.5 mile). The numerous pilings in the river here were used to corral logs as they floated downstream to local sawmills. Today they provide nesting platforms for a growing colony of Double-crested Cormorants (recently more than 200 birds) and numerous Ospreys. There are many places for close-up views along River Road (turn north one block before the bridge). Ruffed Grouse and Gray Catbirds frequent the bushes near the shore. Continue north approximately two miles to the town of Cusick where a small public meadow is adjacent to the public boat launch. This is another excellent spot to scope the river and check for interesting birds in the meadow trails. Bewick’s Wren, locally rare, has been documented singing here in recent years. Cusick is also an excellent place to look for Pine Grosbeak and Common Redpoll during irruptive years. Several excellent birding sites along the opposite bank of the Pend Oreille River are easily reached from Usk. Cross the bridge, turn left onto LeClerc Road (CR-9325) on the other side, and drive north to the Kalispell Indian Reservation. Access to some areas may be restricted; check at the tribal headquarters (1981 Leclerc Road, Cusick, WA 99119; 509-445-1147). In 2.1 miles, turn left onto a road marked by a sign for the Qualispe Pow Wow Grounds. Continue 0.7 mile and turn right onto a dike road at the edge of the river. This gravel lane goes north along the river through the Kalispell Indian Reservation Marsh, returning to LeClerc Road in 1.8 miles. In fall and winter, this is among the best places in Northeastern Washington to see specialty birds of the open country, including Lapland Longspur (rare), Snow Bunting, and American Tree Sparrow. Common Redpolls will also use the open fields to feed. In late summer, if the Pend Oreille river is low, mudflats are exposed adjacent to the dike road and can produce good shorebirding. Continue north on LeClerc Road. In 5.6 miles, turn left onto a gravel lane marked by a sign for the Flying Goose Ranch. The gravel lane goes west from here about one-half mile to the Pend Oreille River. Along the way are broadleaf trees, grasslands, and marsh and river habitats, a combination offering excellent birding potential. Look for American Bittern (rare), Osprey, Northern Harrier, and abundant Virginia Rails and Soras. Here also, in years when the Pend Oreille is drawn down in late summer, the mudflats at the end of the gravel lane are excellent for shorebirds, including records of Black-bellied and Semipalmated Plovers among the more typical species. Bonaparte’s and Franklin’s Gulls have also been documented here. Be sure to check the deciduous trees along the river for interesting species, including a Northern Pygmy-Owl that occasionally visits in late fall and winter. Continue again north onto LeClerc Road for approximately 1.2 miles and turn left onto Riverbend Loop Road, an approximately two-mile-long spur that loops back to LeClerc Road. This is all private property, so be sure to bird from the road. The forested areas along this road are excellent for Chestnut-backed Chickadee, Pacific Wren (abundant), Red Crossbill, and Evening Grosbeak. Black Swift and Merlin (locally rare) have also been documented here. At approximately 1.5 miles, a defunct airfield forms a small seasonal lake. In most years in July and August, this is a premier shorebird spot, though conditions can be highly variable. When there is good late summer mud, up to 100 shorebirds may be present. Solitary and Semipalmated Sandpiper are annual, sometimes in good numbers. Stilt and Buff-breasted (one record) have been documented here. Continue again onto LeClerc Road. To return to the Usk Bridge, turn right (south). To proceed to the jump-off point for the Northeast Corner via the Dry Canyon route (pages 479), turn left (north) for approximately 4.4 miles and bear right onto LeClerc Creek Road. About 3.5 miles north of Cusick, just after the intersection with Westside Calispell Road, SR-20 crosses the Tacoma Creek bridge (Cliff Swallow colony). In another 0.3 mile, turn left from SR-20 onto Tacoma Creek Road. For the next few miles, the gravel road follows the creek through marshy riparian habitat with Red-eyed Vireo, American Dipper, Northern Waterthrush, American Redstart, and many other species. Sportsman Pond, on the right in 4.2 miles (just after the USAF Survival School), can be good for Ring-necked Duck, Common Goldeneye, Hooded Merganser, and Tree and Northern Rough-winged Swallows. Vaux’s Swifts skim the water when the weather is overcast, allowing you to look down on them to observe their brown rumps and tails. The turnoff for Calispell Peak Road (FR-629) is on the left in another 2.1 miles. In years past, this road had a great reputation for boreal bird specialties. However, a once-productive Beaver swamp has been drained, and many of these species are more readily found at other locations such as Abercrombie Mountain, Salmo Pass, or Bunchgrass Meadows. However, the area is ripe for exploring. A high-clearance vehicle is recommended; exercise judgment if you decide to proceed, as you may encounter deep mudholes or water over the road, especially early in the season. The road climbs through a number of cut-over areas where the forest has been opened. The remnant Western Larch and invading brush are fine habitat for Red-naped Sapsucker, Cassin’s and Warbling Vireos, Gray Jay, Mountain and Chestnut-backed Chickadees, Red-breasted Nuthatch, Swainson’s and Varied Thrushes, Orange-crowned, MacGillivray’s, Yellow-rumped, Townsend’s, and Wilson’s Warblers, and Red Crossbill. Look for a cattle guard 4.6 miles in. Continue to a clearing on the left side of the road a few hundred yards past the cattle guard, at about 4,100 feet elevation. Spruce Grouse, Northern Pygmy-Owl, Barred Owl, American Three-toed and Black-backed Woodpeckers, Black-capped, Mountain, and Chestnut-backed Chickadees, Townsend’s Solitaire, Northern Waterthrush, and Moose have all been found in this vicinity. If you have time on your hands and an adventuresome spirit, you may be able to keep driving the remaining six miles to enjoy the view and good fall hawkwatching from the 6,855-foot summit of Calispell Peak. Continuing west, Tacoma Creek Road climbs for 8.8 miles to a 4,200-foot crest, then descends the Olson Creek drainage along one edge of the Little Pend Oreille National Wildlife Refuge, reaching SR-20 in another 4.9 miles (page 470). This road is far better maintained than Calispell Peak Road and passes through similar habitats where you can expect to find most of the same birds.